Although we couldn’t wait to try out our next cupcake stop, the appeal of local brews was too much to resist, so we decided that a savory break would be a good idea. 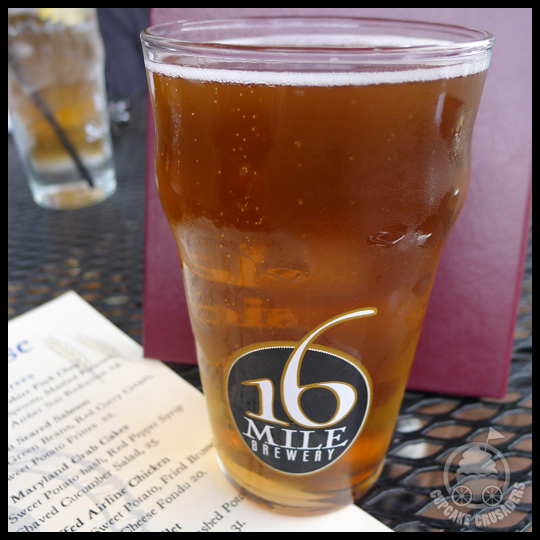 16 Mile Taphouse is situated across the street and about a block down from SAS Cupcakes and offers a full menu, as well as their own 16 Mile Brewery beers (Georgetown, DE). In addition to each selecting a beer to fit our tastebuds, we ordered the 16 Mile Fries to share. The beer cheese fondue that came with the fries sounded the most appealing, but paired with the spicy aioli…perfection! 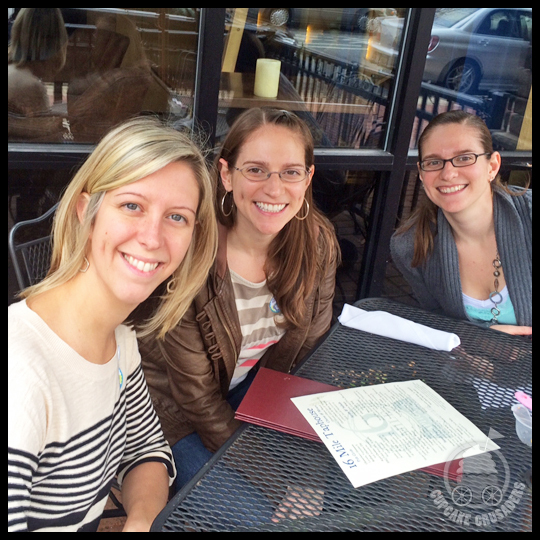 The weather was so nice that we were able to sit outside (and the people-watching was top notch – Newark is a college town and, to our luck, they were having some sort of family day). 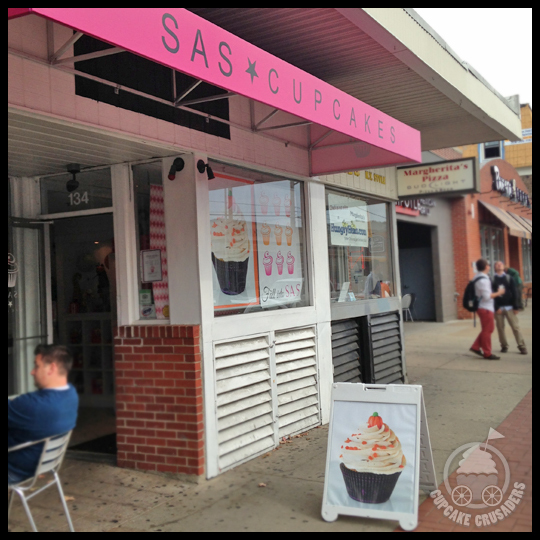 After filling ourselves with savory delights and ample people-watching, we headed up to SAS Cupcakes. SAS Cupcakes makes sure they are easy to find. Although their awning was a little hard to spot while driving down Main Street, the windows are filled with large cupcake photos and they have a sidewalk sign, so it was really hard to miss them. Walking into the store, we were instantly transformed into kids in a candy store. Greeting us were fun chandeliers, cupcake themed gifts, nostalgic candy, and a wall full of party hats for all occasions. It’s hard to do anything but smile in a place like that, and the staff further proved it. They were all friendly, patient, and excited about their store and cupcakes. We were (slightly) more successful in sticking to our one cupcake per person rule here. I think I had more trouble deciding than the rest, because Crusader Elisa’s eyes bee-lined to the Red Velvet and she didn’t look back. You can tell just from the photo that the cream cheese frosting on this Red Velvet cupcake is smooth and buttery, Elisa’s favorite kind of frosting. Red Velvet tends to be one of those cakes that you either love or hate. While Stacy and I lean more towards the “dislike” side, we both agreed that this was one of the top Red Velvet cupcakes we’ve tasted. It was hard to get Elisa’s thoughts into words…she was too busy enjoying her cupcake! Stacy also didn’t take too long to decide, settling on the Frangelico Hazelnut cupcake. Her thoughts were that the frosting was really sweet, but had a good flavor. And while the cake was a tiny bit dry (mainly dense and crumbly), it did have a good natural flavor, unlike some places that offer a moist cake, but taste just like what you’d find in a box mixed. 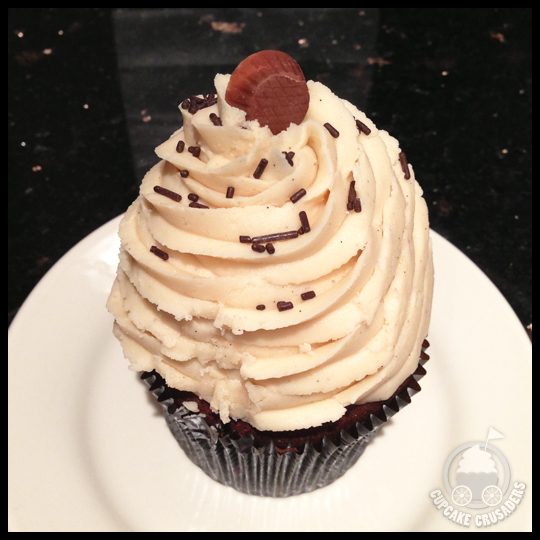 It’s possible that my dad picked the winning cupcake of the day, the Triple Chocolate. It was so incredibly moist, with a rich chocolate cake and dense chocolate truffle center. The chocolate layers continued with dark chocolate ganache on top, a dollop of chocolate buttercream, and chocolate sprinkles. 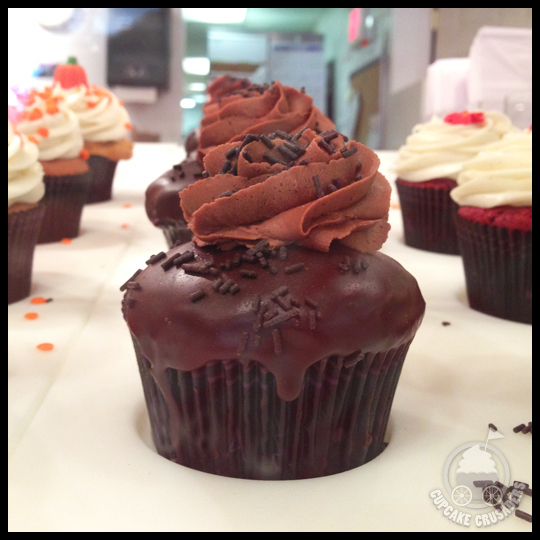 Really, that’s five chocolate elements (not three), but we’ll let SAS Cupcakes off the hook for that. 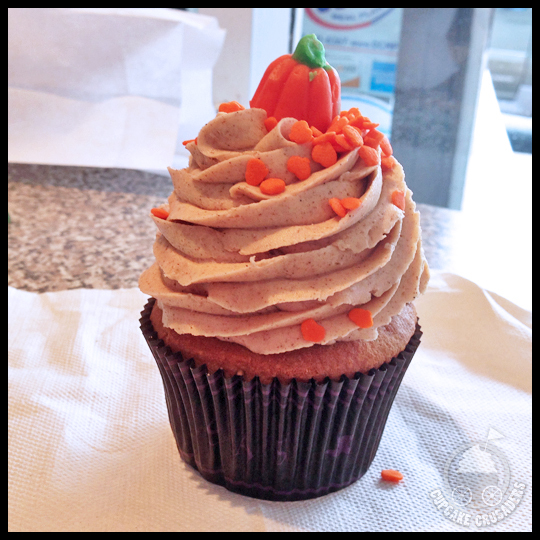 After much debate (and seeing what everyone else was getting…meaning what I’d still get to taste), I settled on the Pumpkin Spice cupcake. I don’t usually like this much frosting on a cupcake, but most of the cupcakes were heavily topped, and the cinnamon in the frosting looked very appealing. As soon as I had this cupcake in my hands, I noticed how sweet it smelled and wondered if I made the right choice. 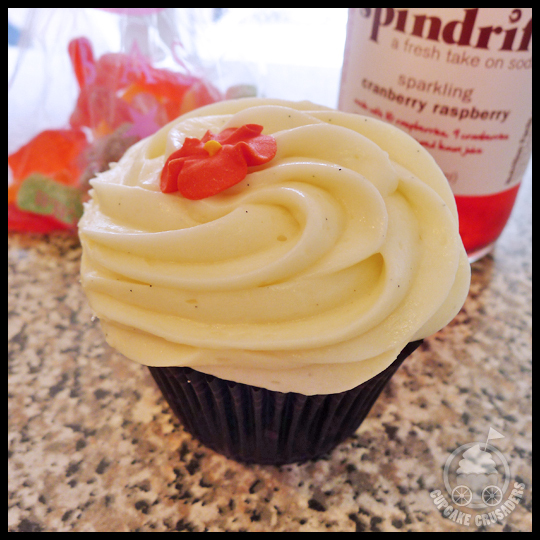 I proceeded with caution and was pleasantly surprised how the spice and pumpkin came through over the sweetness, giving this cupcake a great flavor. However I was left with a kick of sweetness at the end, that stuck with me. The cake was also a little crumbly, not something I’m used to in a pumpkin cupcake, which tend to be very moist and dense. Despite my thoughts on the Pumpkin Spice Cupcake, I decided to select two cupcakes to take home since the Triple Chocolate cupcake was so good. I was really hoping that the peanut butter frosting on this cupcake would deliver big flavor, however it wasn’t very peanut-buttery at all. My initial disappointment was redeemed when I realized that the center of the chocolate cake was loaded with pure, smooth peanut butter. If the frosting had packed more flavor it would have easily overpowered the chocolate cake, but all the elements blended together created a well balanced cupcake in the end. 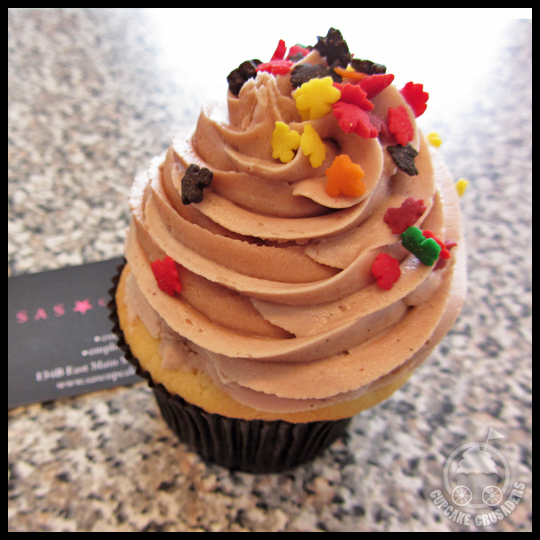 All-in-all, we really enjoyed our trip to SAS Cupcakes. We’d love to go back and explore the town more, grab a beer at 16 Mile Taphouse, and pick up a cupcake or two. 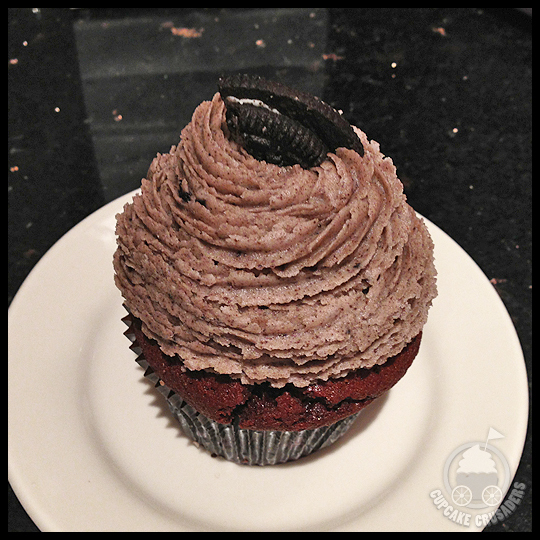 For chocolate lovers, the Triple Chocolate cupcake is reason enough to visit if you find yourself in the area. 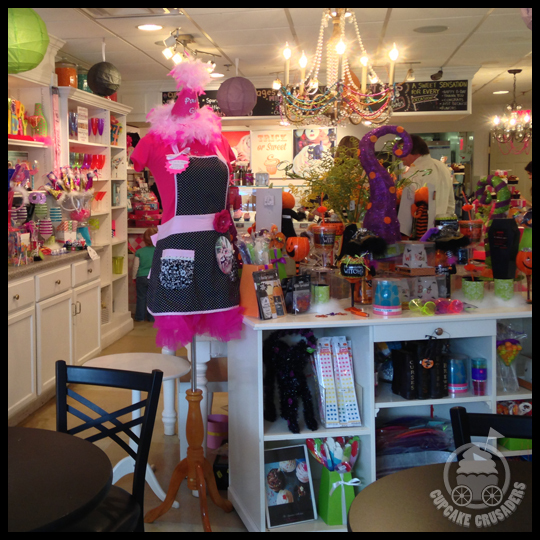 Next week, Crusader Elisa will be sharing our last tour stop, Cupcake Heaven in Wilmington, DE. We had an interesting experience there, so keep an eye out for the review!